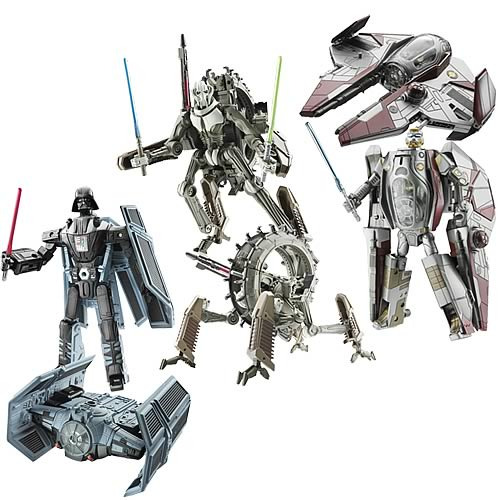 Shopping for Star Wars Transformers? Combining the elements of Star Wars with the engineering of Transformers come Hasbro's Star Wars Transformers! Instead of robots from Cybertron changing to vehicles and animals, this time a vehicle from Star Wars changes in to a robotic version of a Star Wars character! Each individually packaged Star Wars Transformers figure is packaged in vehicle mode and brings a new play experience to the Star Wars Universe! Each figure is packaged on blister packaging and includes a tiny pilot figure of each character.